Explore the rich history and culture of the Bay of Plenty during your stay. 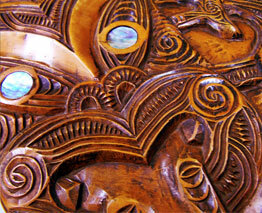 Visit The Elms mission house, Te Awanui Waka the Katikati Heritage Museum and many others. The site of Tauranga’s Te Papa Mission Station, this well-preserved heritage building and grounds are open to the public.The late-Georgian Mission House was built in 1838 as the home of Rev A. N. Brown of the Church Missionary Society. The Mission library still holds many of Rev Brown’s sermons and books and is oldest free-standing library in the country. The canoe Te Awanui is held under cover on this main street in Tauranga. Carved from Totara in 1973 by master carver Tuti Tukaokao, the waka is used on ceremonial occasions. Te Awanui is the original name of Tauranga Harbour. Visit the whanau (family) of a Maori Marae to experience Maori culture, traditions and the renaissance of Maori in today’s New Zealand. The Paparoa and Tutereinga Marae in Tauranga and numerous attractions in Rotorua, offer informative, fun tours of their village, Waka (canoe), with experienced guides explaining the language, traditions, greetings, carvings and much more. Enjoy hands on exhibits and guided tours of the historic life and times of an Irish settlement in the developing Katikati district. Almost one hundred hectares of the historically significant land of the Papamoa Hills has recently been purchased to establish a cultural heritage park. The hills have significant cultural and scientific importance, holding 10 Maori Pa sites with some of their construction thought to date back as far as 1500AD – some of the oldest in New Zealand.